Chris Blattman recently lamented reviewers asking him to cluster standard errors for a true experiment, which he viewed as incorrect, but had no citation to support his claim. It seems intuitive to me that Chris is right (and everyone commenting on his blog post agreed), but no one could point to something definitive. 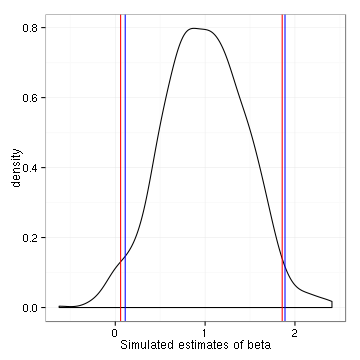 I asked on Twitter whether a blog post with some simulations might help placate reviewers and he replied “beggars can’t be choosers”—and so here it is. My full code is on github. To keep things simple, suppose we have a collection of individuals that are nested in groups, indexed by . For some outcome of interest , there’s a individual-specific effect, and a group-specific effect, . 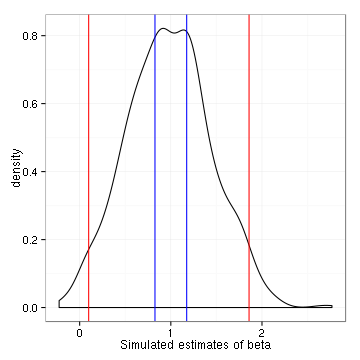 This outcome also depends on whether a binary treatment has been applied (status indicated by ), which has an effect size of . We are interested in estimating and correctly reporting the uncertainty in that estimate. First, we need create a data set with a nested structure. The R code below does this, with a few things hard-wired: the and are both drawn from a standard normal and the probability of treatment assignment is 1/2. Note that the function takes a boolean parameter randomize.by.group that lets us randomize by group instead of by individual. We can specify the sample size, the number of groups and the size of the treatment effect. This function returns a data frame that we can analyze. Here’s an example of the output. Note that for two individuals with the same group assignment, the term is the same, but that the treatment varies within groups. 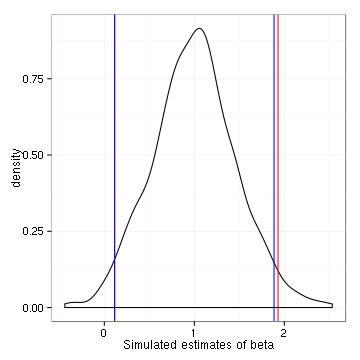 Main takeaway: Despite the group structure, the plain vanilla OLS run with data from a true experiment returns the correct standard errors (at least for the parameters I’ve chosen for this particular simulation). What if we randomize at the group level but don’t account for this group structure? 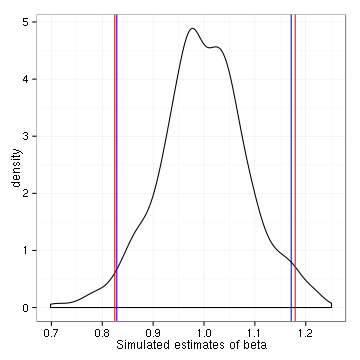 Reviewing papers that randomize at the village or higher level and do not account for this through clustering or some other method. This too is wrong, wrong, wrong, and I see it happen all the time, especially political science and public health. "Simulate running an analysis of the experiment with linear regression"
One closing thought, a non-econometric argument why clustering can’t be necessary for a true experiment with randomization at the individual level: for *any* experiment, presumably there is some latent (i.e., unobserved to the researcher) grouping of the data such that the errors within that group are correlated with each other. As such, we could never use our standard tools for analyzing experiments to get the right standard errors if taking this latent grouping into account was necessary. This entry was posted in Uncategorized on December 9, 2015 by johnjhorton.